Springtime in Vancouver is a gorgeous time to be in the city! While it is bittersweet to let go of winter (sad to see the winter sports go, but happy to have daylight at 6 pm again), spring brings greater access to our outdoor spaces, blooming gardens, whale-watching, and some of the city's most beloved annual festivals and special events. Use this guide to events and activities in March, April,​ and May to find the best things to do in Vancouver in spring. One of the best things to do in Vancouver in spring is to revel in the return to life of our city's best gardens (many of which are free). Enjoy roses in late March through April at the Stanley Park Rose Garden, revel in cherry blossoms at the Dr. Sun Yat-Sen Chinese Garden in April, and see the rhododendrons flourish at Stanley Park's Ted & Mary Greig Rhododendron Garden and at VanDusen Botanical Garden in late May. For lush greenery and blooms throughout spring, there are the Quarry Gardens at Queen Elizabeth Park and the always lovely VanDusen Botanical Garden. If you want to venture further afield then Victoria on Vancouver Island is only a 35-minute flight or a 90-minute ferry ride away. The city is home to many public gardens, including the world-famous Butchart Gardens, which is a delight any time of year but especially in the spring. 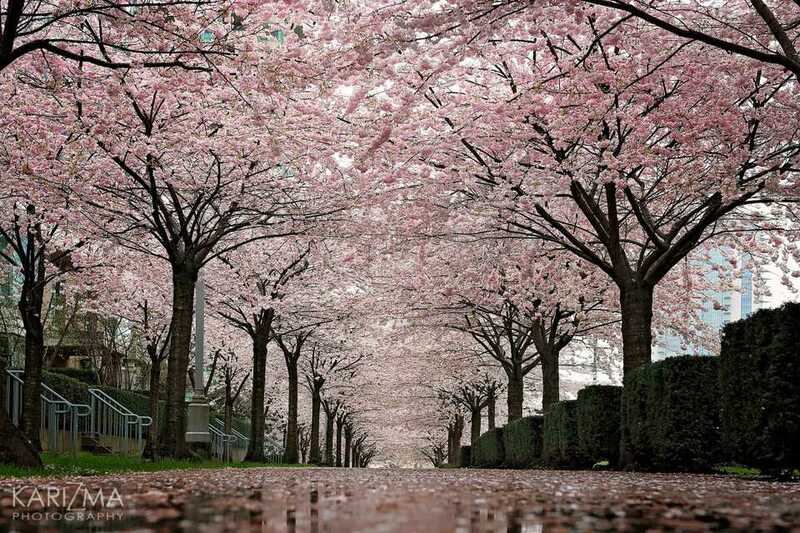 For many, its the soft pinks and whites of our 40,000+ cherry trees blossoming every April that really marks the start of springtime in Vancouver. The annual Vancouver Cherry Blossom Festival, held each year in April, celebrates the blooms with a variety of events for all ages--including a concert in downtown Vancouver and mini-events at venues across the city, including Bike the Blossoms and Cherry Blossom Jam. It's still raining, but there are more afternoon and evening light and it's not quite as cold as winter, all of which (in relative Vancouver terms) means spring is the time to get outside again: hiking, biking, camping, golfing, kayaking. As soon as the sunshine arrives, you'll see Vancouverites rollerblading and biking the seawall, and people planning outdoor adventures. Whale watching season runs from April - October for Vancouver (and nearby Vancouver Island), making whale-watching one of the best things to do in Vancouver in the spring! Whale watching in Vancouver includes spotting grey whales (in April and May), orcas, and a wide variety of other sea mammals. You might also get lucky and see nesting eagles and foraging bears alongside the ocean. Whale watching tours run from Granville Island and Coal Harbour and range from open Zodiac high-speed boats to covered vessels. Most boats head out into Howe Sound towards Vancouver Island and the waters close to Victoria. The confluence of the Fraser River and the Pacific Ocean near the Vancouver International Airport is often a rich wildlife-spotting area as whales gather here to feed on the fish and other sea life that are attracted to this area. Springtime brings a bloom of color to the fields surrounding Vancouver with the Abbotsford Bloom Tulip Festival and Tulips of the Valley in Chilliwack. Make a day trip of it and visit the Fraser Valley's wineries, breweries, and farm shops -- most are open year-round but check before you head out. Transit is not very extensive in the region so a car rental is the best idea to make the most of the attractions. Guided tours of the region are also available, visit Destination BC's website for more information about self-guided routes and tour options. Celebrate BC's most famous seafood every May when the short Spot Prawn season brings these sweet delicacies to our shores and the special shrimp appear on menus and at markets across the city. The annual Spot Prawn Festival is held at Granville Island every May and it's possible to buy fresh fish and seafood directly from the boats at Fishermen's Wharf. What Is Vancouver Like in April?